Millennials now represent the largest generation in the in the workforce - and this generational change is having a significant impact on employers. Join us to discuss key insights based on generational behaviour and the way in which the LifeWorks solution targets the Millennial audience on Nov 8th at 1:00pm EST. 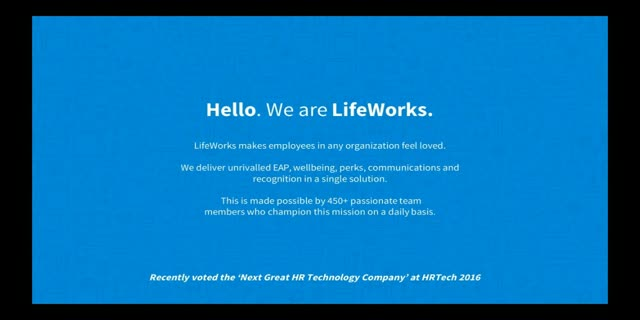 LifeWorks is an employee engagement power brand, with more than 15 million happy users across US, Canada and UK. We service 49,000 businesses, provide a network of 20,000+ clinical experts and 16,000 retail merchant partnerships. Jamie True (CEO), David Ossip (Chairman) Jack Bekhor (CFO) Jon Harris (COO), Ceridian and Thomas H. Lee (Investors), Sir Terry Leahy, (Advisor), Lord David Alliance(Advisor), Bob Willet, Ex CEO Best BUY (Advisor), Tim Davie, CEO BBC Worldwide (Advisor), and John Claydon Ex Omnicom (Advisor).